Acer laptops shown at the Computex show in 2013. Best known for its low-cost laptops, Acer doesn't really inspire thoughts of premium products. But building high-end hardware could be the Taiwanese vendor's best shot as it looks for a way to rescue its struggling business. With consumers flocking to tablets and smartphones, Acer's once-thriving PC business has been left in the dust. Quarterly financial losses have become routine at the company and its PC shipments declined more sharply in the past year than at any other major vendor, according to IDC. The grim situation forced CEO J.T. Wang to resign from his post on Tuesday. Acer will also cut 7 percent of its global workforce and has assembled an advisory committee to come up with a new strategy, the company announced. Bright spots are hard to find. The Wintel model that propelled Acer for years and helped it become the second-largest PC vendor in 2009 has been falling apart amid the demand for mobile gadgets. And Windows 8 and Intel's Ultrabook strategy have failed to resuscitate the market. It hasn't helped that Acer is so reliant on sales to consumers, said IDC analyst Bryan Ma. The entire PC industry has been hurt by tablets, but Dell and Hewlett-Packard have at least managed to find cover selling PCs to businesses, which are still buying them. And Lenovo has capitalized on its position in China, now the world's largest PC market. "Acer didn't really have the commercial PC business to protect themselves. That's why they were hit harder," Ma said. Acer -- whether to its benefit or detriment -- has instead gained a reputation for low-priced PCs. Even in tablets it has tried to undercut rivals -- its Iconia W4, an 8-inch Windows 8.1 tablet, starts at US$329.99, while its Iconia B Android tablet goes for $129.99. The low prices have helped keep the company on consumers' radar, but at the expense of profits. One option for Acer is to build a brand as a higher-end PC player. It took a step in that direction last year with the Aspire S7, a Windows laptop with a slender, aluminum chassis that sells for $1,200 and up. That product and its successors have had some success for the company, with sales of 2,000 to 3,000 units per month, said James Wang, an analyst with research firm Canalys. "I think Acer has started to learn they are able to sell some expensive products," he said. Selling higher-end PCs could help stop the bleeding in Acer's finances, but with the overall PC market still shrinking it's unlikely to help it expand in any meaningful way. "You can't really expect vendors in desktops and notebooks to find growth," Wang said. "You win in the market by not falling in shipments." Acer might have to try breaking into other markets or raise its profile among business customers. Some of its rivals have taken that path, with Lenovo buying up PC makers in growth countries, and Dell and HP selling enterprise "solutions" that include services. "If Acer continues to only sell PCs, in just a few years' time it will be over for them," predicted Gartner analyst Eileen He. "If you're simply a hardware maker, it's not enough." Acer's fortunes reflect the collapse of the larger PC market as a whole, which led HP to consider selling its PC business and has forced Dell to make itself a private company. 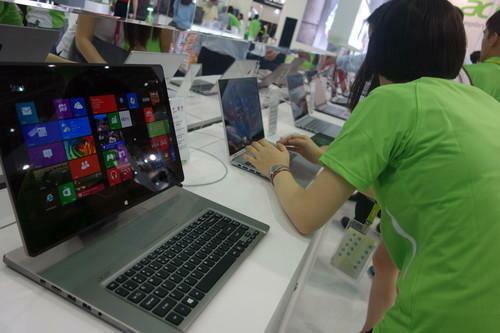 Acer's big Taiwanese rival, Asustek, has also seen its PC sales decline. But its willingness to experiment with innovative, sometimes off-the-wall products has helped bring strong growth to its Android business, and its profits haven't suffered like Acer's. HP and Dell have much broader businesses to fall back on, giving them some leeway as they try to build effective tablet and smartphone strategies. But for Acer, with its narrow focus on consumer PCs, any big change will be easier said than done, potentially requiring it to invest more in research and development, overhaul its supply chain and build new brands. "You can't just turn a big boat on a dime," IDC's Ma said. "It takes time to make that course correction. The question is how quickly can they turn their boat."